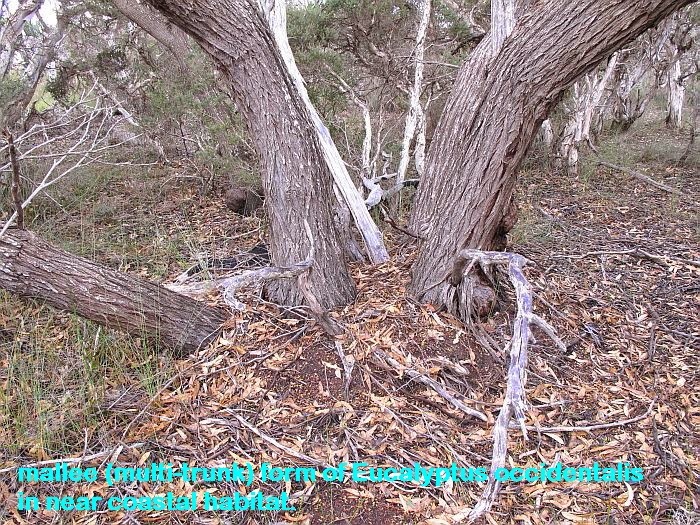 This eucalypt is one of the tallest in the Esperance region and a very hardy species, able to withstand prolonged periods of dry or wet conditions. Locally it favours hollows along light drainage zones, which are seldom more than 5 hectares (12 acres) in area that can flood (winter/spring) during a wet year to a metre (3’) in depth. The topsoil is often a heavy loam over clay, which is slow to drain, but nevertheless will dry out completely by the summer/autumn and without decent rainfall can remain so for several years. 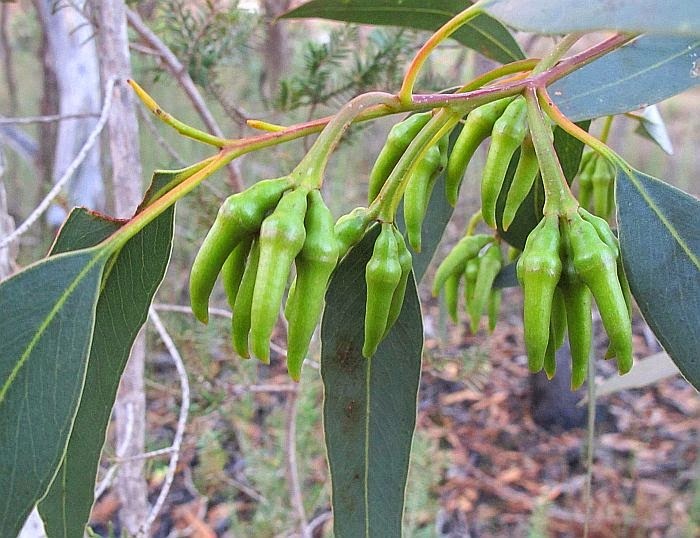 In coastal areas the Flat-topped Yate commonly grows as a mallee (multi-trunked), whilst usually a tree (single trunked) inland (to avoid confusion the term mallee applies to either a multi-trunked eucalypt, or an inland district where many mallee eucalypts grow). 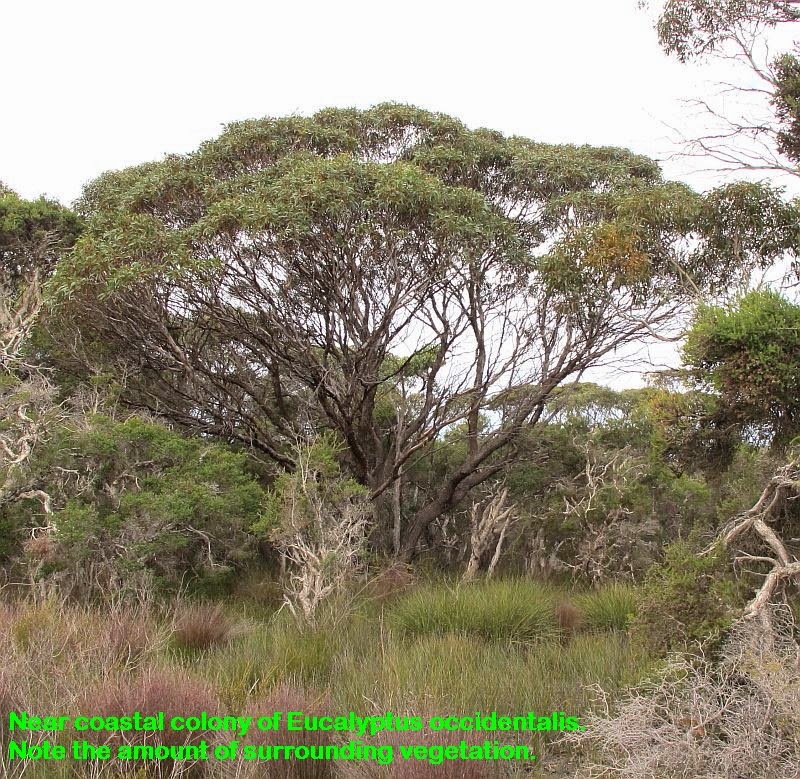 From the two full length photos above, it can be seen the coastal eucalypt due to the higher rainfall is growing with other vegetation, which in the event of a bushfire this extra fuel load will ensure all are burnt. 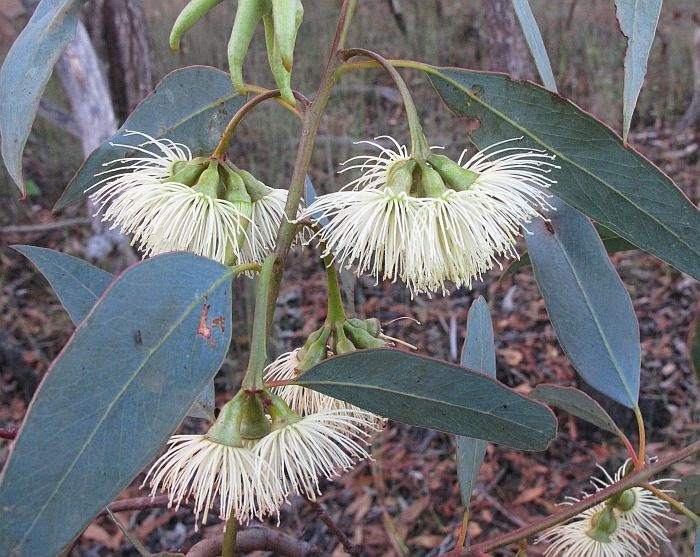 After a bushfire the coastal Eucalyptus occidentalis will regenerate from an underground lino-tuber to grow two or more new trunks, these eucalypts tend to be shorter, but wider than the inland form, seldom growing more than 15 metres (50’) in height. 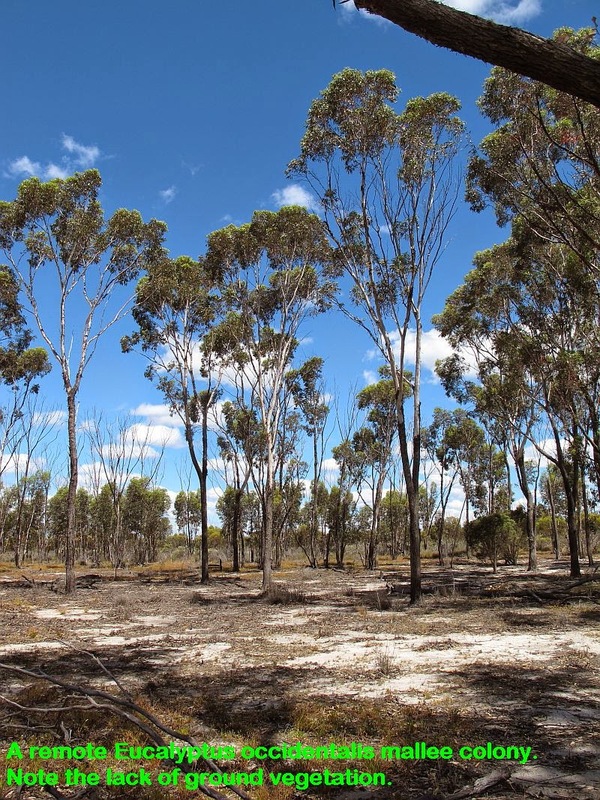 On the other hand the inland form, due to lower rainfall (average around 30 cm or 12” year) have very little ground cover, so can grow for many years without being seriously burnt and so retain a single trunk. 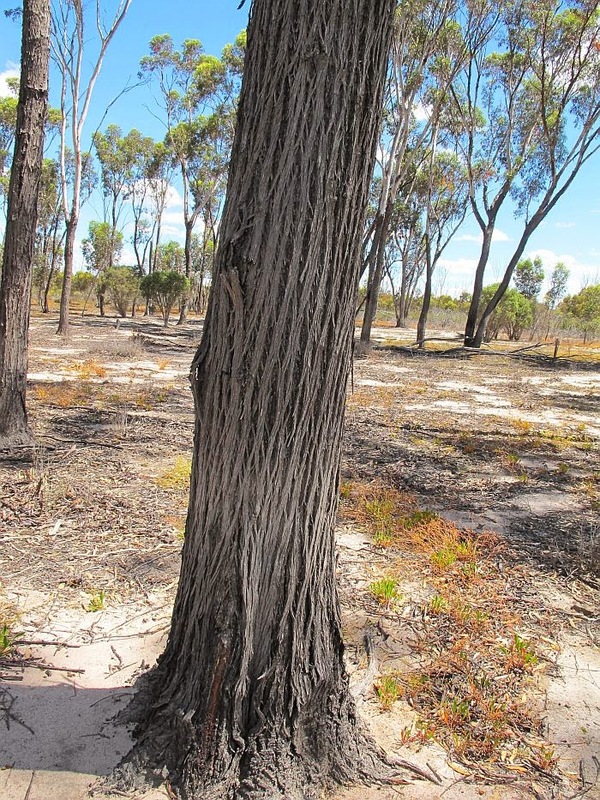 Trees however on the outer edge of the habitat and mixed with taller vegetation are commonly burnt and may also develop a mallee (multi-trunked) form. These inland trees can reach 25 metres or over 80’ in height. 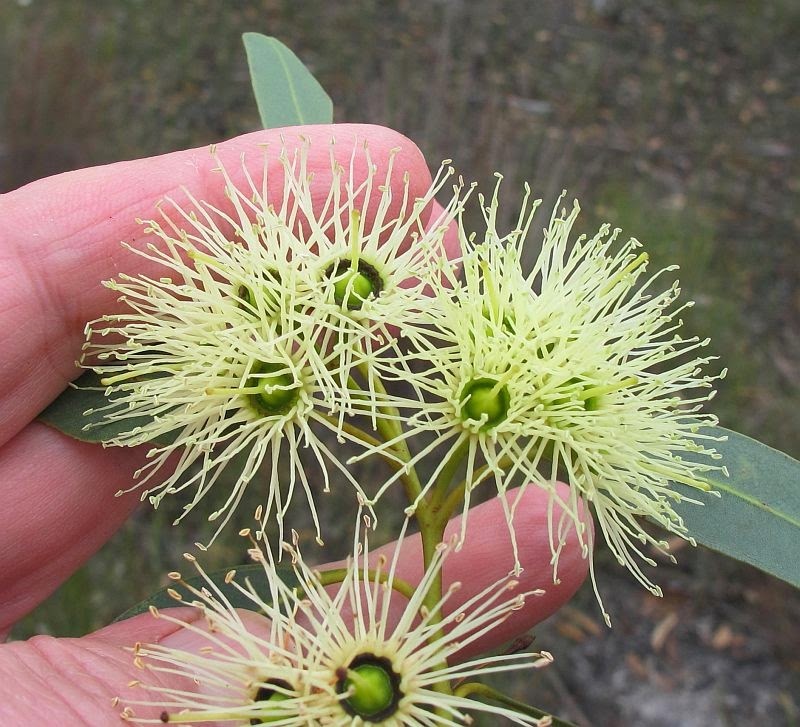 The unpredictable habitat of this eucalypt has made it a very hardy species, even tolerating alkaline and saline conditions, so is commonly used for wind and shelter breaks around farming properties. The timber is hard and durable and besides being good fuel, has also been used for poles and fence posts. The cream or white flowers produce large quantities of nectar and bloom in autumn when there are few other flowering plants about, it therefore attracts many honeyeating birds from far and wide, which usually also have to compete for the nectar with feral honey bees. 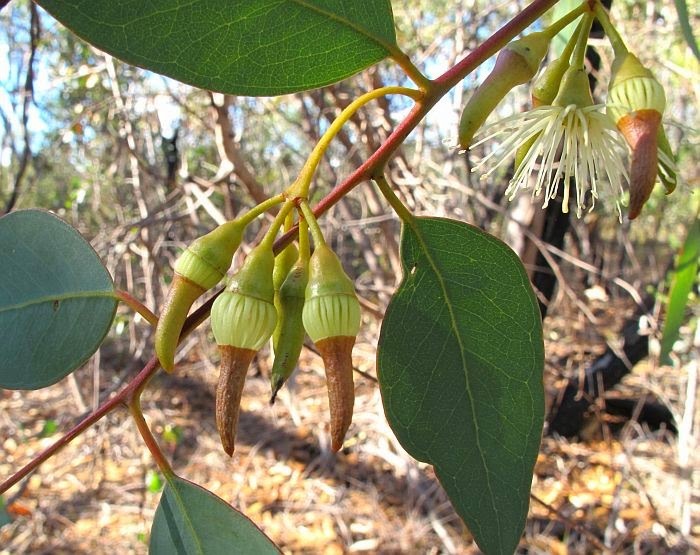 Eucalyptus occidentalis is a WA endemic, naturally occurring in near coastal environments from Israelite Bay (east of Esperance) to the Albany region, but also extends inland to around 150 km (95 miles), where it is less common. 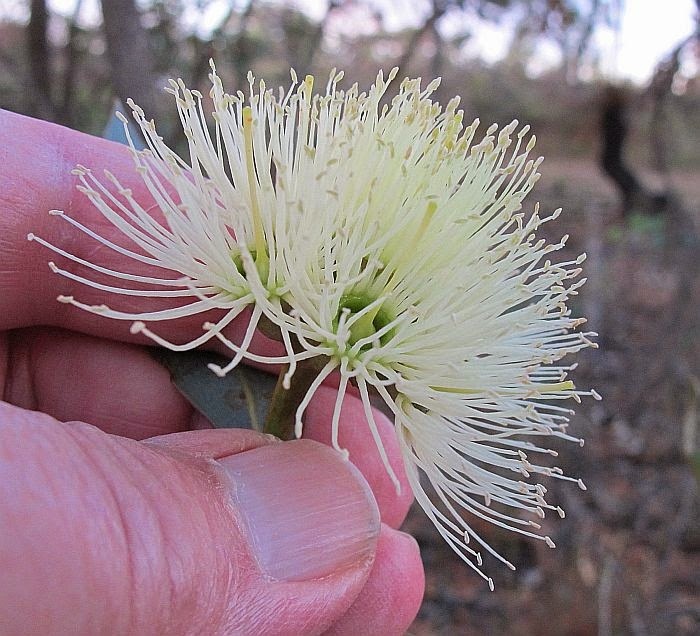 Flowering is officially recorded during two periods from September to December and from January to May, however near Esperance it is not unusual for them to flower off and on from January to August. 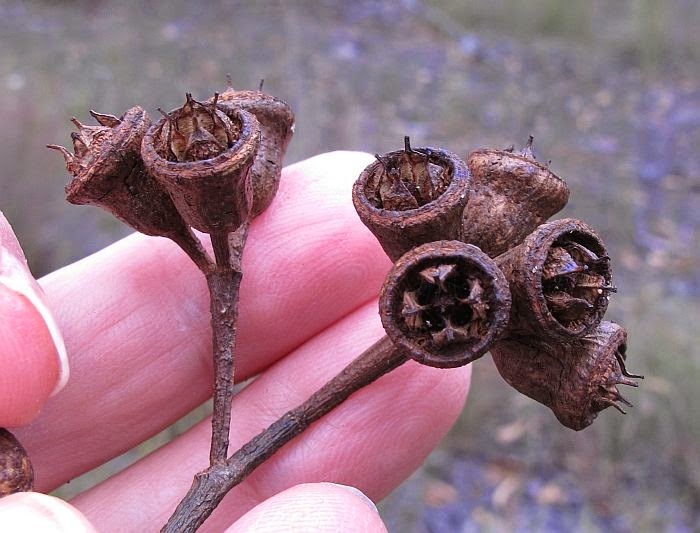 This species can be easily identified in the field by the flaky rough bark at its base that extends up the trunk to at least the first branch, but with an upper section that has an attractive smooth light coloured bark. 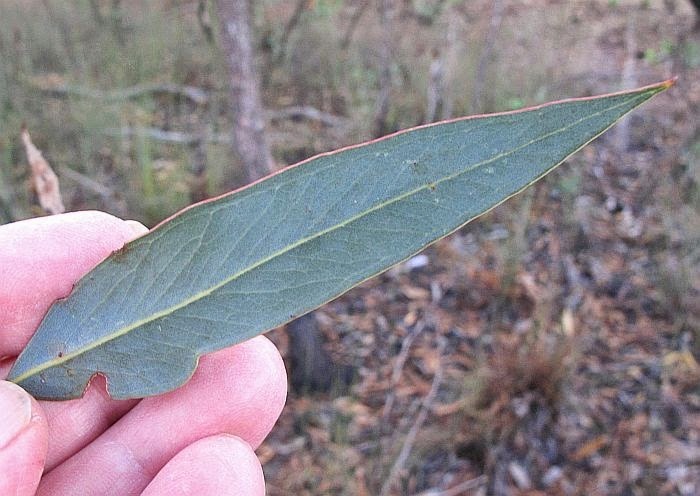 Eucalyptus is part of the very large and highly diverse Myrtaceae family.